To help you find us here's a small map. Click the map for a larger version with directions. Travel south on Highway 1 to Hamilton, take Highway 3 towards Waitomo Caves / Te Awamutu. Just beyond Te Awamutu (on Highway 3) at Kihikihi turn left towards Putaruru (Whitmore St) travel 9kms. At Stone Store turn right on to Owairaka Valley Rd (signposted Mangakino/Taupo) 14kms along, just past Castlerock. Take Highway 5 north towards Hamilton 46kms. Turn left into Highway 28 to Putaruru 8kms. At the roundabout in the centre of Putaruru turn right into Main St, left into Princes St, then right into Arapuni St (all signposted Te Awamutu/Arapuni). Travel 38kms, turn left in to Owairaka Valley Rd (signposted Mangakino) 14kms along, just past Castlerock. Head north a short distance on Highway 1 (signposted Rotorua/Hamilton). Near the top of the first hill turn left on to Pohipi Road (signposted Kinloch/Te Kuiti) travel 35kms. Turn right on to Highway 32 (signposted Te Kuiti) Turn left at Whakamaru junction on to Highway 30 (signposted Te Awamutu/Te Kuiti) stay on this road straight ahead where Highway 30 turns off left. Travel 43kms, turn right at road's end (Waipapa Rd, signposted Te Awamutu) 2kms along. Take Highway 29 over the Kaimai Ranges. Turn left on to highway 28 to Putaruru. From Putaruru see directions as from Rotorua. From Turangi & further south on Highway 1. 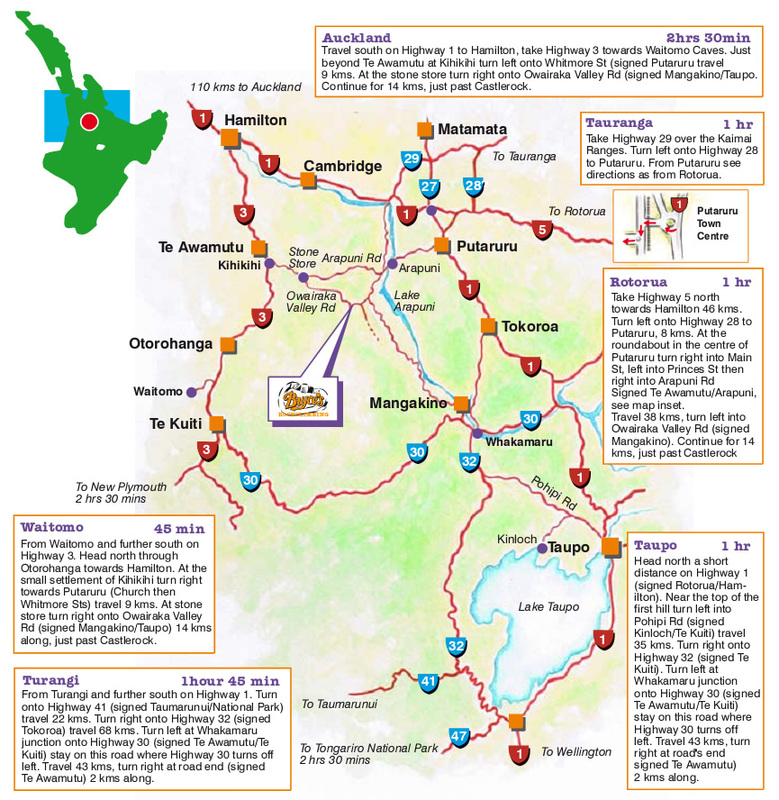 Turn on to Highway 41 (signposted Taumaranui/National Park) travel 22kms. Turn right on to Highway 32 (signposted Tokoroa) travel 68kms. Turn left at Whakamaru junction on to Highway 30 (signposted Te Awamutu/ Te Kuiti) stay on this road straight ahead where highway 30 turns off left. 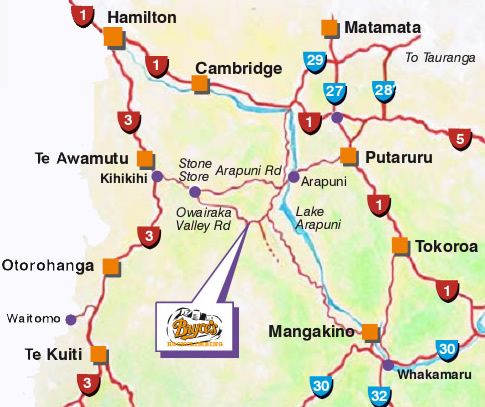 Travel 43kms, turn right at road's end (Waipapa Rd, signposted Te Awamutu) 2kms along. From Waitomo & further south on Highway 3. Head North through Otorohanga towards Hamilton. At the small settlement of Kihikihi turn right towards Putaruru (Church then Whitmore Sts) travel 9kms. At Stone Store turn right on to Owairaka Valley Rd (signposted Mangakino/Taupo) 14kms along, just past Castlerock.